The Sonoran Desert's Salton Sea is California's crown jewel of avian biodiversity. Second only to the Texas Gulf Coast in avian abundance, the Sea hosts more than 400 species of birds each year. This volume is the first full-length book to focus attention on the Sea's unique natural wonders and importance while providing a wealth of useful information for birders and naturalists. 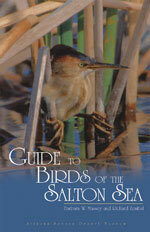 For readers wishing to visit the Salton Sea, this book provides detailed descriptions of 15 birding sites. Each site chapter has a brief description of the area and its vegetation, directions for getting there, a site map, a section on the birdlife, and a table listing birds seen, their abundance and seasonality. For those coming to the Salton Sea to see a specific bird, the book includes species accounts pinpointing where and when each species is most likely to be seen. Guide to Birds of the Salton Sea also includes chapters on nocturnal roosts, nesting, rare species, species of concern, as well as cumulative tables. Barbara Massey is a retired field biologist with extensive research on endangered coastal birds in southern California. Richard Zembal is a retired wildlife biologist who works on wildlife planning and management through the Santa Ana River Watershed Program.